Malaysia runs two parallel legal systems. The civil courts cater to its non-Muslim citizens while the Islamic system decides issues affecting the fate of the country’s Muslim majority. The civil judiciary covers a range of major cases while the Islamic legal system focuses on family law, frequently tackling issues such as divorce, polygamy and custody battles. An increasing number of cases heard in the Islamic courts involve both Muslims and non-Muslims. A Christian lawyer in Malaysia has failed in her attempt to be allowed to practise in the Muslim Shariah courts. Victoria Jayaseele Martin said she wanted to appear for non-Muslim clients fighting in such courts, to provide them with fairer representation. However, a judge in Kuala Lumpur dismissed her challenge. 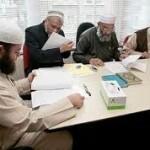 The judge uphold the decision of a religious council that all lawyers in Islamic courts must be Muslim. Ms Jayaseele Martin, who says the bar is unconstitutional, plans to appeal against the judge’s decision. Ms Martin’s lawyer, Ranjit Singh, said it was difficult for non-Muslims to find legal counsel, who may not want to defend cases that conflict with their own faith. One of the lawyers for the Federal Territories Islamic Religious Council, Mr Abdul Rahim Sinwan, said it was “not a problem” for non-Muslims to find Muslim lawyers to defend them. “It goes one step further because it’s a question of faith. Because when the Muslim holds the opinion held by the judge, it’s a question of faith, in which non-Muslims doesn’t (have it),” Mr. Sinwan added. The Shariah courts are governed by Shariah laws that are based on Islamic traditions. A practicing lawyer must be a Muslim and needs to have a formal training to have an adept understanding of how Shariah laws work relative to Islamic culture in general.